Wendy Connor’s world is made of stories—so many stories, she says, that it is hard for her to choose only a few to share with us in the time allotted for her talk, to demonstrate what remembering Meher Baba means to her. She recalls Mani clapping her forehead and saying, “Oh, too many stories!” because Baba’s hand is in every detail, so every detail is a story, and every story triggers another story. Wendy remembers the day she first met Elizabeth Patterson and Kitty Davy. Her mother, Jane Barry Haynes—Wendy’s link to Baba—brought Wendy to Youpon Dunes at age five. The little girl was all prettied up for the occasion, and when she walked up the steps of the house, she thought she was ascending the steps to heaven. Elizabeth was standing at the top of the steps dressed in her favorite shade of blue and holding her hand behind her back, as she characteristically did, because her back was a bit off kilter from her having fallen off a horse at age fourteen. With the sunlight illuminating her white hair, it looked as if she had a halo, and Wendy forgot all about her mother as she gazed up at Elizabeth. In a sense, that first meeting was Wendy’s first meeting with Baba, because it was her first experience of complete acceptance and unconditional love from these two extraordinary women who greeted her like an old friend and who embodied the special qualities of naturalness, purity, and absolute surrender to the Beloved. The following year, Wendy met Meher Baba for the first time, when she was two months shy of her seventh birthday. 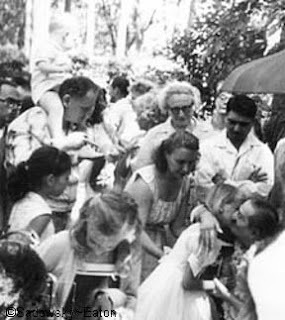 He had come to Center in May 1958, for the last of His three visits. All Wendy knew about the man she was going to meet was that He was named Baba, which meant Father, and that He was from India (she had no idea where that was). She could feel how very excited Kitty and Elizabeth were in anticipation of Baba’s arrival. Imagine Kitty, already so full of energy, going into high gear! In preparation, Jane took Wendy shopping for a dress to meet Baba in. They found the perfect outfit—a sleeveless purple dress in dotted swiss (a lightweight cotton with little raised white dots)—and there was one just like it for Jane to wear: their first mother-daughter outfits. Jane also took Wendy for a haircut, and her flaxen hair was styled with bangs for the first time. She was thrilled and excited, ready to meet Baba. Yet she had no idea, really, who she was going to meet. Baba arrived in Myrtle Beach on May 17. Jane Haynes met Him on Monday the 19th (this powerful story is told in Jane’s book, Letters of Love for Meher Baba, the Ancient One). Baba had said Jane was not to take the three children out of school. Her eldest, John, met Him after school on the 20th, Charles on the 21st, and Wendy on the 22nd. Kitty had the idea that Baba should see the film of His 1956 visit to America that had been taken by the Sufis of Sufism Reoriented, and the perfect place to show the films would be the summer stock theater in Myrtle Beach that Jane directed (the building that housed the theater—the Shrine Club—is still there on Highway 17). So, on the 21st, Baba told Elizabeth to tell Jane to bring Wendy to the theater a half hour before the films were to begin. Wendy recalls, “My mother had become the center of my universe. I was holding on to her hand, not knowing what to expect.” Suddenly Baba appeared in the doorway, wearing His pink coat, carried in His chair by the dancers (four young men who were Margaret Craske’s ballet students). The sun pouring in lit up His head like a giant halo. Baba gestured for the dancers to put His chair down. He had a big smile on His face. The very first thing He did was express His delight at how Wendy and her mother looked in their matching dresses. He put His fingers to His chest to show that His heart was touched. Baba also commented on how tall Wendy had grown. She replied, “Yes, Baba, I’m very tall.” She was not at all aware of His silence during this exchange. Baba beamed and opened His arms wide. Wendy remembers letting go of her mother’s hand and running into Baba’s arms without any hesitation. In His embrace, time stopped. It felt as if that embrace went on for hours (Eruch later said it was maybe three minutes). Then Baba took Wendy by the shoulders and pushed/pulled her back and forth. His whole body was shaking with silent laughter and His face turned pink as He playfully squeezed her cheeks together and then told her to speak. Someone said it was time to go into the theater, and Baba signaled for the dancers to pick up His chair. Wendy knew, “That was it for me,” and she started to panic. “Baba, may I stay with you?” she implored. Baba said she could walk with Him into the theater. Inside, she plopped down by Baba’s right foot, while her brother Charles sat at His left foot. Suddenly she remembered her mother. Jane was signaling for the children not to be so forward. Immediately Baba told Jane to leave them be. The film was then shown to Baba and the others. “Can you imagine looking at a film of Baba while He is sitting right there? Even as a child I knew it was silly,” Wendy says. She could not take her eyes off His beautiful feet. Whenever she looked up at Him, He patted her on the head or stroked her cheek. Jane Trio saw Baba again in November 1962 at the East-West Gathering in India. Wendy was eleven—a huge difference from age six. She felt very shy, because now she had been told that she had met the Christ. Wendy went up the steps to Guruprasad in Poona and saw Baba seated on the blue sofa, wearing a blue coat this time. Baba noted that now Wendy was even taller than at their first meeting. In fact, she was almost as tall as Mani by this time. Baba saw the Westerners in groups, and the Haynes family was included with the Myrtle Beach group even though they lived in New York at the time. Baba asked everyone about their health. Did they sleep well? Did they eat well? He related to people on their level, in a way that even a child could understand—no discourses. The Westerners got extra time with Baba—perhaps He felt they needed it more. On one of these occasions, Baba gave Wendy a tiny glimpse of His divinity. Wendy began to swoon and fall backward, but then Baba did something so that the feeling stopped and she recovered herself. Baba gestured as if to say, mischievously, “What did you think of that?” Wendy knew He was who He said He was—God in human form—and that if He really showed Himself to us, we would lose consciousness. To love Me is to love all. To love all is not to love Me. To love Me in all is to love Me. Point #1. Baba loves obstacles and challenges. It’s His way of working. Wendy closed her talk with a story that took place on Saturday, February 1, 1969. She was at home getting ready for Happy Club (the Saturday program at the Center for poor inner-city children that Wendy started around 1965 or 1966). She was making the peanut butter and jelly sandwiches that the children always had for lunch. The phone rang, and it was Kitty, telling her, “Auntie Boo wants you to come over.” Wendy said OK, and since she was not dressed yet, she took her time. Five minutes passed, and the phone rang again. It was Kitty, demanding to know where she was. Wendy was surprised—she’d thought Kitty meant she was to come just before Happy Club. Kitty replied that here wouldn’t be any Happy Club that day. And then Wendy knew. And so the Easter talk came full circle. Jai Baba. Thank you for these wonderfully inspirational stories. Jai Baba! I had trouble reading the last paragraph through the tears. Thank you for the wonderful stories of times spent with Baba. I especially smiled and felt such joy when Baba and Wendy "connected" as he looked into her eyes she got a glimpse of the devine. 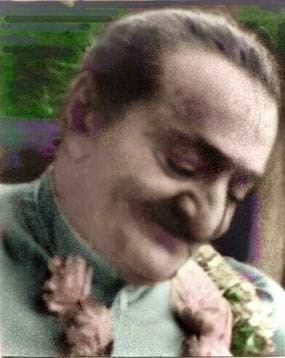 All quotes of Meher Baba © Avatar Meher Baba Perpetual Public Charitable Trust unless otherwise indicated. Writings by Kendra are © Kendra Crossen Burroughs unless otherwise noted. 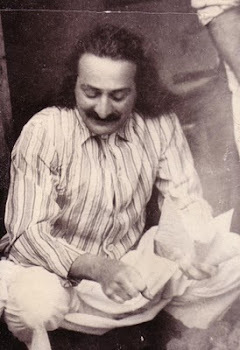 "An Introduction to Meher Baba"
-Allan Cohen: Who Is a Baba-Lover? “Never let the generation to come say that you did not tell them about Him." -Audio: Listen to "The Ocean of Love"
-Pilgrimage: Meher Mount, Ojai, Calif.
-School: Sufism Reoriented, Walnut Creek, Calif.
“To experience your real self is the goal. You are and you will ever be. There is no one else but you. Instantly, in a flash, you will know everything, including why you have no beginning and no end. But this knowing will have nothing to do with mind, reason, logic. It is beyond mind. You know the answer to everything, you know that nothing has happened and nothing will ever happen. You then experience bliss, you become all-powerful, all-knowing." This blog was started on 5 May 2007. The counter was added 24 August 2007.